Vast numbers of people are protesting against the failure of government and politics, the demise of marriage and family, the breakdown of job and economic markets, the antagonistic cultural and social issues, and more. People everywhere are searching for meaning and purpose in life and to become part of a movement that will bring much-needed reform. But where do we start? History reveals that when God is the focus of a people, their nation flourishes. We must start with a reconsideration of God. The restlessness in our hearts is evidence that God, whom we’ve pushed out of society and deemed irrelevant, is the Reformer we need. Is mankind the supreme authority over world events? Does God exist and if so, what is His character, will, and intentions for the world? There are many religions; is there more than one God? Where can I find the peace and rest for my soul? What are my life’s meaning and purpose, and how can I make a significant impact in the world? The significant impact you long to make is possible. Revive Your Life! Rest for Your Anxious Heart is written so you can become all you were meant to be. In Revive Your Life! Rest for Your Anxious Heart, author Pamela Christian gives us a picture of God’s love in a way that will most likely be a game-changer for many. She does so with the skill of an artist and the scholarship of an apologist, yet she writes with the compassionate heart of a pastor. This book illustrates the biblical concept “the truth shall make you free.” One translation reads, “you shall know the truth in an experiential way, and the truth shall make you free.” That well represents the backbone of this book. It is an invitation to the ongoing experience of truth through a relationship with a perfect heavenly Father. Revive Your Life! is a tool that will bring great numbers of people into the freedom they were born for through the discovery of their God-given purpose and significance. A well-known song recorded years ago aptly declares, “What the World Needs Now Is Love.” This is truer today than when the song broke upon the scene a generation ago. In fact, Jesus Himself warned us that in the “Last Days” the love of many would turn cold! But thank God for people like Pamela Christian who is brave enough to say, “Not on my watch!” Revive Your Life! Rest for Your Anxious Heart is truly a manual full of directions on how to rekindle your faith, hope, and love and arise to fulfill your distinct call in this generation. If your heart needs to be revived, then read on. This was written with you in mind." Revive Your Life! Rest for Your Anxious Heart is the logical and indispensable conclusion to Pamela Christian’s trilogy, Faith to Live By. Having established in volume one the historical and objective truths of Holy Scripture—in contrast to the flawed and unsubstantiated claims of non-Christian religions—she leads readers in volume two to experience the hope, rewards, and “breakthroughs” available to all who accept God’s promises and the life-changing power of biblical Christianity. In this third volume, Pamela sets out to lead her readers step-by-step through and beyond the deceptions, pitfalls, and other obstacles that the enemies of Christ—both demonic and human—put forth to discourage potential and practicing Christians from embracing a truth-based, God-centered life. But Pamela doesn’t stop here. Ultimately, volume three is all about God’s love, and how “to enter a transformed life of freedom, joy, and victory” through a genuine, empowered relationship with Jesus Christ. In Revive Your Life! Pamela Christian helps her readers embrace a loving relationship with their Creator. She explains how to grow and mature in this relationship, both experientially as well as practically. As a natural result of this, she explains how God’s love can play out in each of our lives to impact our sinful, suffering world for Christ. Whether you are a spiritual seeker, a new believer, or a mature Christian facing spiritual struggles and doubts, this book is for you. 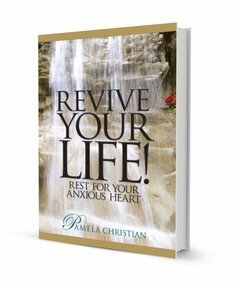 Pamela Christian’s Revive Your Life! is informative, inspirational, and challenging. This third volume in her highly readable trilogy (following Examine Your Faith! and Renew Your Hope!) puts some very important truths in the Christian faith on “the bottom shelf” and will be edifying to those seeking truth and to new converts, as well as to those who have walked for many decades with Jesus. While I am in disagreement with the author on the extant nature of some of the spiritual gifts experienced by the first century Church, I would recommend this book to all who seek to know more about the Christian faith. Pamela Christian has produced another book in her Faith to Live By series that will be an encouragement to many. She paints an exciting biblical picture of what it means to be a follower of Christ--and bases it on the very best mix of fact and feeling.